NEW ALBANY, Ind. 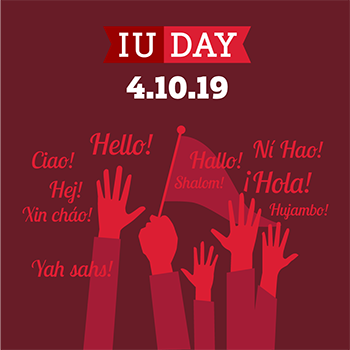 — At midnight and continuing throughout Wednesday, April 10, Indiana University will observe IU Day, a 24-hour worldwide celebration promoting engagement, university pride and giving. Show your school spirit! Wear cream and crimson on April 10. Take a selfie at the IU Day photo booth in the Commons from 11 a.m. to 1 p.m. Post your picture on Facebook, Twitter or Instagram with the hashtag #IUday and get free IU swag. Take part in IU Southeast trivia contests and photo challenges throughout the day on Twitter (@IUSoutheast). Be the first to answer correctly, and you’ll win IU gear! Share your photos of retro IU, intense IU fandom, and your travels around the world on social media with an #IUday hashtag for a chance to win $1,000 for your favorite IU cause. The IU Day team will select winners for the IU Is Everywhere, Back in My (IU) Day, and Biggest IU Fan Challenges. For more information about these contests, visit the IU Day Give website page. Support the university you love! Donate to IU Southeast Police outreach programs through the IU Outreach Programs, Southeast Campus fund or visit give.iu.edu and follow the instructions. Visit iuday.iu.edu throughout the day for IU trivia, games, mini-lectures, videos and more. The IU Southeast Police Department is sponsoring “Po Po and Puppies” for students to de-stress before they prepare for the home stretch of the semester. Take an IU Day selfie and be an IU Southeast Ambassador by sharing your IU Day photo on social media with an #IUDay hashtag. Come out for a family friendly night of bowling and celebrate IU Day at the Clarksville Strike and Spare with IU Southeast Alumni. Wristbands will include one game of bowling with shoes, skating, laser tag, bumper cars, and/or laser frenzy. Register for the Family Fun Night today!